Nineteen people have been killed and more than 100 arrested, after a vicious gun-battle between rival Segway gangs in Texas. Police confirmed that opposing factions, the Gadget-addicts and the Green-businessmen Gang, met in a large Walmart carpark to settle a turf dispute. An ensuing gun-battle between hundreds of Segwayers was described by witnesses as “All out war”. Police chief Randy Fukwizc said “The Segwayers chose the carpark because of its easy pavement access, lack of sharp inclines, and the relatively low speed of other vehicles – all of which are necessary conditions if you’re basically riding a battery-powered hobby horse. The resulting carnage left 19 dead, and many Segwayers in hospital or jail. This isn’t the first Segway-related violence. Last summer in Florida Segwaying members of a bridge club ran into a group of retired dentists, and a slow-speed war broke out in which one octogenarian had a toothbrush lodged in her inner ear. 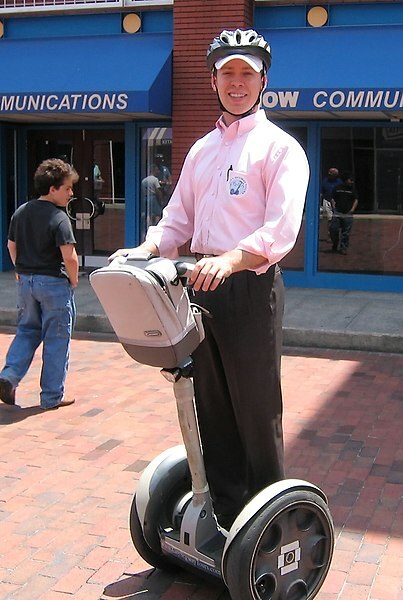 But why are so many drawn to the Segway sub-culture? Chief Fukwizc said “I don’t know what it is about two-wheeled vehicles that just brings out the inner warrior. You don’t get gangs of trike-riders engaging in all out war, or unicyclists jousting with home-made spears on the motorway. Posted on May 19, 2015 at 11:06 am in Film, Satire, Society, USA	| RSS feed You can	trackback	from your own site.